Puccio di Cetto arrived in San Gimignano from Val di Pesa around the year 1000, the same period that Vernaccia appeared in San Gimignano. The mention of his name is the earliest reference to the Cetti family in San Gimignano. “Paradiso,” the name of the original estate (meaning paradise), first appeared in local literature during the 13th century. The estate later became property of Callimaco Bonaccorsi, a noble from San Gimignano. The Cetti family — including Nello Cetti, Giuliano Cetti, and Martino Cetti — became one of the most important families in San Gimignano township during the 14th and 15th centuries. Giuliano and Martino remained in the San Gimignano area and became substantial landowners (to give you an idea of their stature, they commissioned a tomb for their family in 1423 which included a depiction of the Annunciation by Renaissance artist Ghirlandaio). Nello became a professor at the historic law school at the University of Bologna. In 1973, the Cetti family purchased Podere Paradiso, which, over time, would become the centerpiece of the family’s holdings. Today, the Poderi del Paradiso (literally, the “Paradiso estates”) extend over an amphitheater of vineyards at the foot of San Gimignano, including 30 hectares planted to vine. Together with consulting enologist Paolo Caciorgna, the estate’s invaluable partner, they produce 150,000 bottles of wine each year. The estate also includes 1,300 olive trees that produce excellent extra-virgin olive oil. The winery makes numerous versions of Vernaccia di San Gimignano, a wine that the owners love, of course. But they also continue to experiment with San Gimignano’s terroir. In the early 1980s, side-by-side with the area’s traditional grapes, Vernaccia and Sangiovese, they also planted Cabernet Sauvignon and Cabernet Franc, Merlot, Syrah, and Chardonnay. 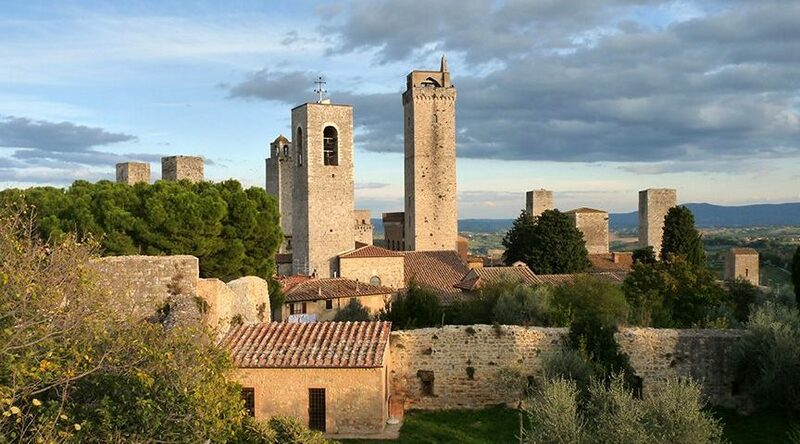 Above: The medieval village of San Gimignano, known for its many towers. Photo by Lorena Torres Angelini (via Flickr Creative Commons).